Super Savings Item! 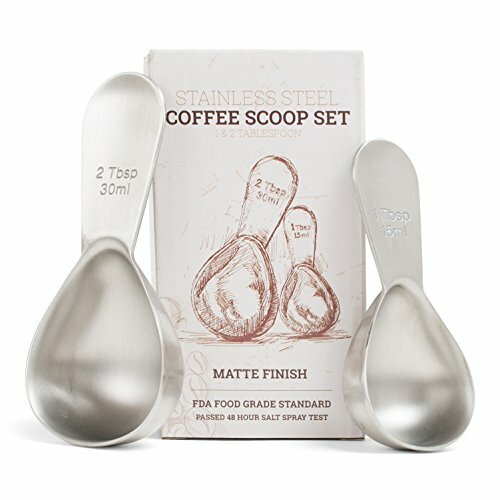 Save 39% on the Coletti COL105 Coffee Scoop, 1 Tablespoon & 2 Tablespoon Set by Coletti at Baking Love. MPN: COL105. Hurry! Limited time offer. Offer valid only while supplies last. Brew up the perfect cup or pot of coffee every time a premium stainless steel coffee scoop! Featuring a compact, ergonomically engineered design. Brew up the perfect cup or pot of coffee every time a premium stainless steel coffee scoop! Featuring a compact, ergonomically engineered design. Tired of guessing how much ground coffee you need for your automatic coffee maker, espresso machine, French press, or pour-over system? Skip all the fuss with the Coletti Set of 2 Stainless Steel Coffee Scoops! Three tablespoons of ground beans produces one 10-ounce cup of coffee. Use these spoons to quickly and accurately measure the grounds and ensure a delicious-tasting brew EVERY SINGLE TIME. Trust us: these aren't your typical coffee scoops. Unlike conventional measuring spoons with flat handles, ours are specially designed to provide a secure grip and are actually comfortable to hold. Plus, they're small and compact so they take up less space in your drawers! Solid stainless steel craftsmanship makes this scoop set the only one you'll ever need. They won't rust, bend, or break. What's more, they're great for so much more than coffee. These handy recipe companions can be used to accurately measure flour, loose leaf tea, oil and so much more. The Coletti Set of 2 Stainless Steel Coffee Scoops makes a great gift for housewarmings, weddings, bridal showers & more. Backed by our 100% RISK FREE GUARANTEE! **All proceeds from the sale of our products are used to fight human trafficking and promote peace on earth. Click 'Add to Cart' to buy now! TAKES GUESSWORK OUT of measuring: Forget the scale! Use a premium stainless steel coffee scoop to quickly measure out ground coffee or whole beans and optimize the quality and flavor of your brew. ERGONOMIC DESIGN: Specially engineered to allow a secure and comfortable grip no matter the size of your hands. Compact shape means they take up less space in your drawers. HIGH GRADE STEEL: Made of thick 18/8 304 stainless steel to last forever. You'll love the solid, heavyweight feel of these spoons (54 & 40 grams respectively). FDA approved for use with food and dishwasher safe. MULTI PURPOSE: Not just for coffee! Use these measuring spoons for scooping & measuring flour, sugar, tea, oil, vanilla extract and more. **Your purchase supports the fight against human trafficking. SATISFACTION GUARANTEED: If you're not positively thrilled with your coffee scoop set, just let us know and we'll give you your money back. You can even KEEP the scoops! If you have any questions about this product by Coletti, contact us by completing and submitting the form below. If you are looking for a specif part number, please include it with your message.